Summary: Researchers have identified a signaling pathway that promotes sensory neuron grown and prevents peripheral neuropathy when blocked. Peripheral neuropathy (PR) is a condition resulting from damage to the peripheral nervous system — the vast communications network that transmits information between the central nervous system (brain and spinal cord) and the rest of the body. Symptoms range from numbness, tingling and muscle weakness to severe pain, paralysis and organ dysfunction. An estimated 20 million Americans have some form of PR, which can be a symptom of many diseases, including diabetes and HIV, or a side effect of some chemotherapies. Previous research has described at least some of the fundamental processes involved in healthy, on-going peripheral nerve growth regeneration, including the critical role of mitochondria — cellular organelles that produce adenosine triphosphate (ATP), the energy-carrying molecule found in all cells that is vital to driving nerve recovery after injury. 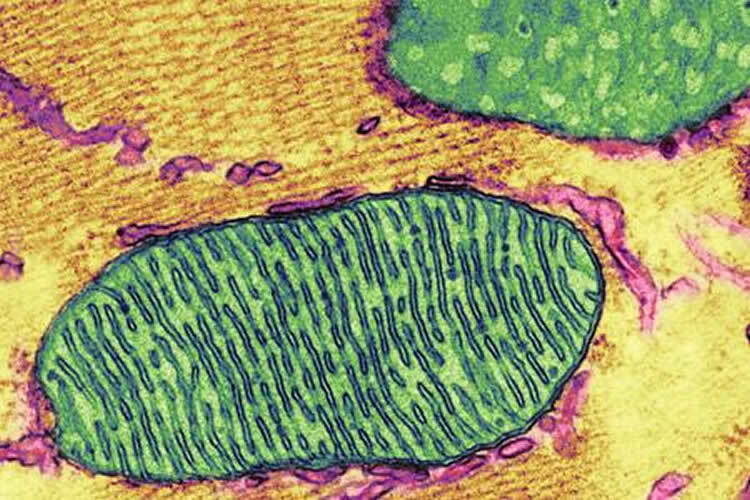 A colorized electron micrograph depicting mitochondria. These organelles — the power plants of every cell — play a critical role in peripheral nerve growth regeneration. NeuroscienceNews.com image is credited to Thomas Deerinck, National Center for Microscopy and Imaging Research, UC San Diego. In their JCI paper, the researchers looked for key molecules and mechanisms used in sensory neuron growth and regrowth. In particular, they noted that the outgrowth of neurites — projections from a neuronal cell body that connect it to other neurons — was constrained by activation of muscarinic acetylcholine receptors. This was surprising, they said, because acetylocholine is a neurotransmitter usually associated with activation of cells. Co-authors include: Katie Frizzi, Teresa Mixcoatl-Zecuatl, Nabeel Muttalib, Joseline Ochoa, Allison Gopaul, and Corinne G. Jolivalt, UC San Diego; Darrell R. Smith, Mohammad Golam Sabbir, Kubir K. Roy Chowdhury, Ali Saleh, Randy Van der Ploeg, and Lori Tessler, St Boniface Hospital Research Centre, Winnipeg, Canada; and Jürgen Wess, NIDDK/National Institutes of Health. Disclosure: Fernyhough, Calcutt and Lakshmi Kotra of the University of Toronto are founders and shareholders in WinSanTor, Inc., a San Diego-based biotech that has licensed intellectual property from UC San Diego and the University of Manitoba to develop treatments for neuropathy. Funding: JDRF, Canadian Institutes of Health Research, National Institutes of Health with support from the St. Boniface Hospital Foundation funded this study. Image Source: NeuroscienceNews.com image is credited to Thomas Deerinck, National Center for Microscopy and Imaging Research, UC San Diego. UCSD “Blocking Neuron Signaling Pathway May Lead to New Treatments For Peripheral Neuropathy.” NeuroscienceNews. NeuroscienceNews, 17 January 2017. UCSD “Blocking Neuron Signaling Pathway May Lead to New Treatments For Peripheral Neuropathy.” http://neurosciencenews.com/peripheral-neuropathy-signaling-pathway-5958/ (accessed January 17, 2017). Sensory neurons have the capacity to produce, release, and respond to acetylcholine (ACh), but the functional role of cholinergic systems in adult mammalian peripheral sensory nerves has not been established. Here, we have reported that neurite outgrowth from adult sensory neurons that were maintained under subsaturating neurotrophic factor conditions operates under cholinergic constraint that is mediated by muscarinic receptor–dependent regulation of mitochondrial function via AMPK. Sensory neurons from mice lacking the muscarinic ACh type 1 receptor (M1R) exhibited enhanced neurite outgrowth, confirming the role of M1R in tonic suppression of axonal plasticity. M1R-deficient mice made diabetic with streptozotocin were protected from physiological and structural indices of sensory neuropathy. Pharmacological blockade of M1R using specific or selective antagonists, pirenzepine, VU0255035, or muscarinic toxin 7 (MT7) activated AMPK and overcame diabetes-induced mitochondrial dysfunction in vitro and in vivo. These antimuscarinic drugs prevented or reversed indices of peripheral neuropathy, such as depletion of sensory nerve terminals, thermal hypoalgesia, and nerve conduction slowing in diverse rodent models of diabetes. Pirenzepine and MT7 also prevented peripheral neuropathy induced by the chemotherapeutic agents dichloroacetate and paclitaxel or HIV envelope protein gp120. As a variety of antimuscarinic drugs are approved for clinical use against other conditions, prompt translation of this therapeutic approach to clinical trials is feasible.